First created by the reforms of Maximilian I, the Landsknechts were his answer to the threat of the Swiss pikemen, and have earned an excellent reputation. Bitter rivals of the Swiss, no quarter is asked or given when they encounter one another. 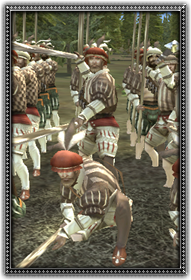 These elite mercenaries are equipped with long pikes and wear their distinctive and elaborate slash and puffed shirts and hose. A Large Stone Wall is a truly formidable barrier, with extremely strong gate defences. A Huge Stone Wall is awe-inspiring for defender and attacker alike, and no besieger attacks them lightly. A Castle stamps its owner's authority onto the landscape, making dominion clear for all to see. A fortress is a permanent statement of ownership, and not something that is easily taken. A Citadel is the ultimate defensive structure, its three-ringed stone walls form a strongpoint without compare!